These rail cars are headed for Coos Bay, from where the logs will be shipped to China. Sawmills disappeared from Albany decades ago, but a part of the business has returned in the form of a small company that buys logs and resells them to mills in Oregon and as far away as China. The operation of Oregon Forest Grown Products LLC is centered on part of the Union Pacific yard south of Ninth Avenue and east of Jackson Street. It has been there for a year and three months, and now the business is really taking off, the owner, Jerald Bush, told me by phone today from his home in Kings Valley. 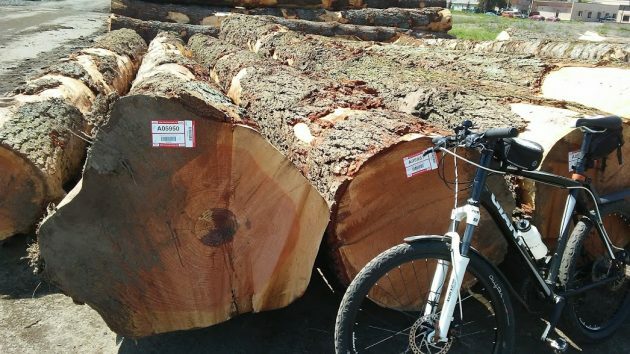 Stacks of big logs on the site prompted questions from readers, and on a bike ride Sunday, I took a look. No reloading was going on, but five rail cars sat on a siding, ready to go. Bush told me they were scheduled to leave as early as Monday night, headed for Coos Bay. The logs — hemlock, spruce, Doug fir and white fir — are going to China. Bush, 64, went to Philomath High School and started logging when he was 14. His friend from school operates the Albany reloading yard, and his daughter runs the office nearby. The company buys logs from all over western Oregon and resells them to the best markets. Some go to Oregon mills, such as Roseburg Forest Products. Big logs, Bush told me, usually go to Coos Bay for export to China. There, some of the wood is used for concrete forms but most of it becomes the raw material for coffins. Oregon mills no longer have a use for logs that are too big for their machinery or too rough to yield much salable wood. Logs waiting to be shipped at the Albany yard of Oregon Forest Grown Products LLC. Perhaps this going new concern could fix the Queen Avenue railroad track washboard-like surface that is rough enough to jar your eye teeth out, since the Lebanon-based railroad won’t, nor the Union Pacific….but Ron Irish probably feels like it’s as good as new. That train sits at my door and has not moved for over a month. Does not bother us at all. It was rolled up in the middle of the night and they were sneaky. We both come from small logging towns and logging families; we rather enjoy looking at the log piles, better than a neighbor’s fence. They moved the train today. Looks strange now. Willamette Ind., before being taken over by Weyerhaeuser in 2002, was sending logs to Japan. All the top-grade logs went to Japan, and the logs with worms or rot stayed here. So, it is not just a recent thing, since the retooling of any remaining sawmills to take tiny logs, that our logs have gone overseas. You wrote about Weyerhaeuser’s Crabtree log yard when you were still editor of the D-H and about their sending all our logs overseas. It really bothers me to see our logs going to China! It just does not seem right to send our natural resources overseas to be made into finished products. Flying into Eugene today, I looked down and saw another RR log loading yard doing the same thing they are doing here in Albany and Crabtree. It makes me wonder how many more yards there are. 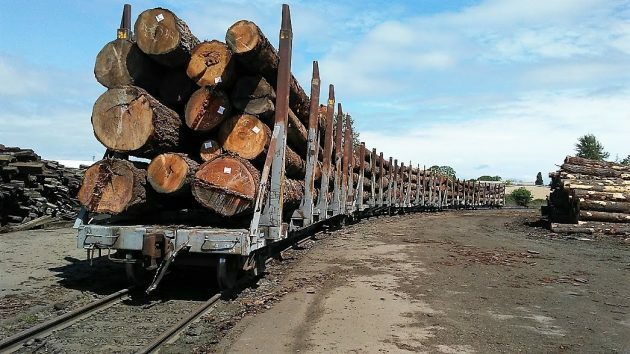 I am glad USA people are employed harvesting and transporting these trees/logs, but sending them to China for processing is just not right in my thinking. Some of the logs that are being exported to China have no other market in the Northwest. At least this gives the log owner some place to sell their logs, other than to be sent to a chip yard, where it could be sent overseas anyway.